Video marketing tools for business with great analytics. Start your 2-week free trial today, no credit card required. http://wistia.com/twist. It’s Drones Week and the official launch of This Week in Startups / Inside Drones podcast! Drones are becoming ready for primetime. They are safe, easy to fly, and are now able to do actual commerce in the world because regulations are becoming reasonable. 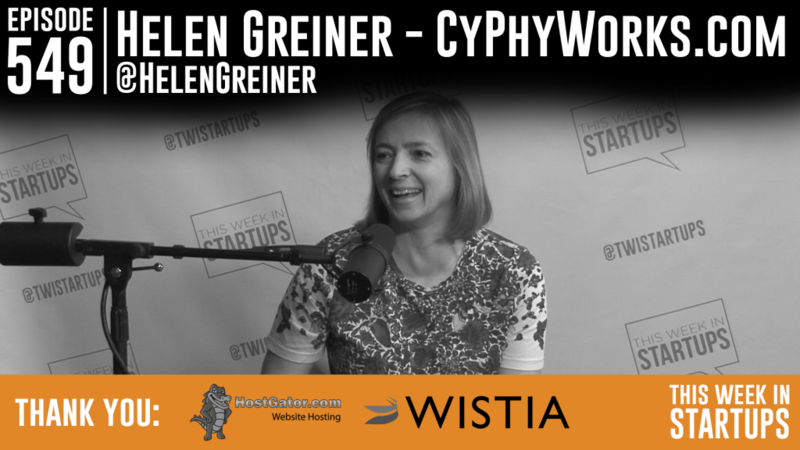 Our first drones guest expert this week is Helen Greiner, Founder & CEO of CyPhyWorks (a drone robotics company), also Cofounder of iRobot and inventor of the Roomba vacuuming machine. Tune in as Jason and Helen have an exciting drone demo & discussion about what makes hexacopters far superior to quadcopters and helicopters, how CyPhyWorks was able to blow their Kickstarter campaign goal out of the water and raised more than $500,000 for their first hexacopter (which will retail for under $600! ), how seeing R2-D2 in Star Wars for the first time is when Helen knew she wanted to build machines that were more than machines, why real-time social sharing is important with drone flying, how there has FINALLY been a proposed set of FAA commercial drone regulations that will make commerce possible, and how Helen wants her company to be the drones delivering packages to your home. Jason also gets a chance to live demo the CyPhyWorks LVL 1 drone! Join us!